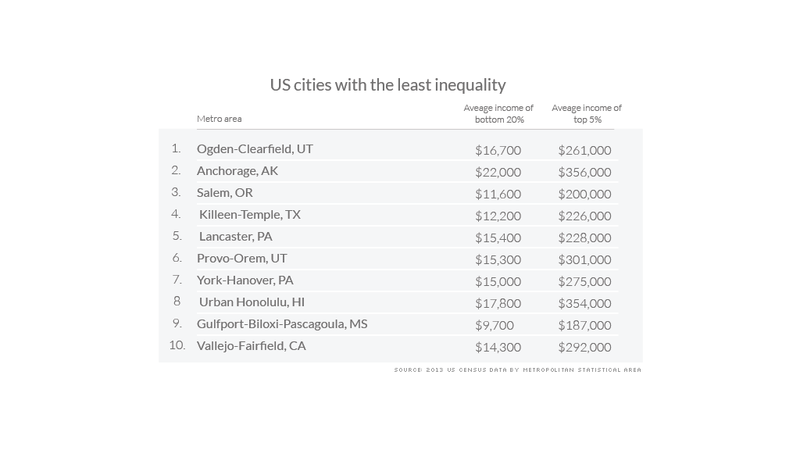 York, Pennsylvania is one of the cities with the least income inequality in America. I moved to New York City almost exactly two years ago. People often ask me what the biggest difference is about living in the Big Apple versus the small Pennsylvania city where I lived before. Here's the one that stands out the most: Inequality. New York has one of the biggest gaps between the rich and the poor in America. The wealth split is evident everywhere in New York -- from the type of transportation people take to work (private car versus subway or bus) to the cross streets where people live (Park Avenue versus the Bronx). And that's to say nothing of the fact that a lot of people in Manhattan can pinpoint your income just by looking at your handbag and shoes. Money is a constant conversation in New York City, from how much you tip to what you pay in rent. I used to live in central Pennsylvania. It's mere hours from New York City by car or train, but it often feels like another country, and not because of the Amish. Central Pennsylvania is home to Lancaster and York, two of the most equal cities in America. They are places where that gap between the have and have-nots is at its smallest. While salaries are lower where I was before (the median household income in the New York City area is $66,000 compared to around $57,000 in Lancaster and York), it's easier to make your money go further. "When friends and family come to visit, they're blown away at the prices of things, especially beer or a glass of wine," says Jennifer Brillhart, who moved to York, Pennsylvania with her husband after living in Manhattan and Philadelphia. Costs add up: Housing costs roughly 360% more in Manhattan than York, Pennsylvania and groceries are over 40% more expensive in the Big Apple. To put that another way, a person making $50,000 in York would need to make over $100,000 to have a similar lifestyle in New York City, according to CNNMoney's Cost of Living calculator. Brillhart can get a sandwich, bag of chips and soda for $4 at York's popular Central Market. She and her husband moved to York because they easily found jobs in law and non-profit management, but they stayed because of the quality of life. It's much easier to afford a home and day-to-day necessities, and there's less traffic. 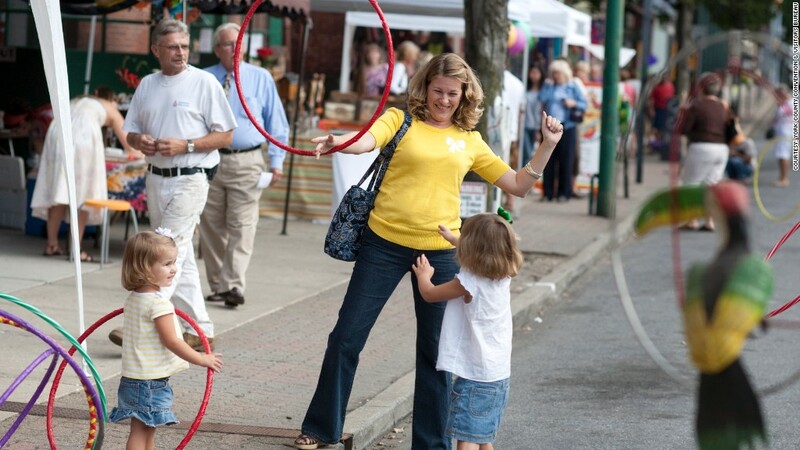 Not just a boring town: Jami Rhynes grew up near Lancaster and couldn't wait to leave sleepy farm country behind, but after living in Michigan and Japan for a few years, she found her hometown transformed. Rhynes is the Chief Deputy Register of Wills and rattles off numerous restaurants and specialty coffee shops she loves in downtown Lancaster. When I ask if her friends talk about rent and budgets, she laughs and says that would be a strange conversation. "I always thought I would live in New York City. Now I can't even imagine it," says Rhynes, 34. "We have such a close knit and intertwined city." Eric Kazda had a similar experience. He never envisioned living in Lancaster, but he's glad he ended up there. He started an internet marketing business in 2008 that has expanded regionally, and he was able to buy a nice house for under $200,000. "There are lots of emerging businesses [in Lancaster]. The night scene has grown with lots of bars and restaurants over the past 5 or 6 years. It's a really interesting place to be," Kazda, 34, says. He's only a few hours from clients and entertainment in Washington D.C., Philadelphia and New York, but his daily lifestyle is much less stressful. Big versus small cities: It's perhaps not surprising that many of America's cities with the biggest inequality problems are places like New York, Miami and Los Angeles. They attract billionaires, but also immigrants and those who fall out of the mainstream, willingly or not. In contrast, many of America's most equal communities are smaller cities -- places like Anchorage, Alaska, Salem, Oregon, and York, Pennsylvania -- that have several hundred thousand residents. They may not have the culture that the global metropolises do, but many have a large and thriving middle class. 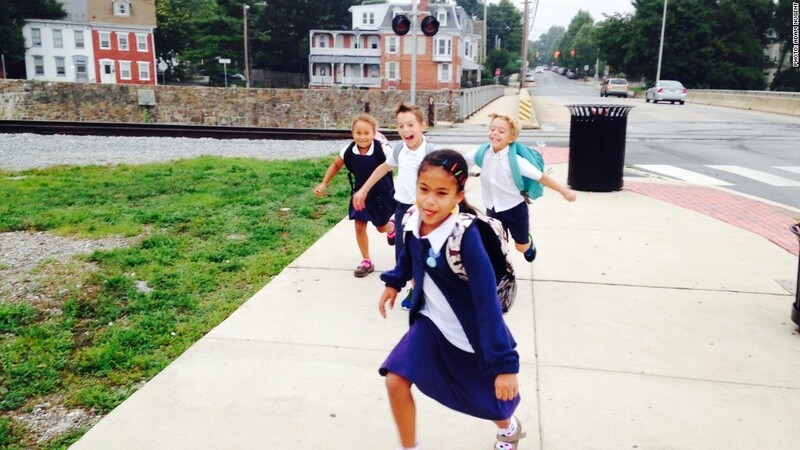 Children on their way home from school in York, Pennsylvania. Of course, no place is perfect. Rhynes notes that in recent months Lancaster has developed a problem with panhandling. And both Lancaster and York have had struggles with racism as the Latino population increases. But residents in these cities are quick to point out the many collaborations going on between groups like the Lancaster Young Professionals and the First Thursday Latino network. The bottom line is it's easier to "make it" in a place where most people earn close to the median income and are able to afford a house and a night out from time to time. As the debate about inequality in America intensifies in the 2016 election cycle, it's important to remember that there are places that are thriving without leaving so many people behind. You can even get your specialty coffee or gluten-free baked goods in these cities, it just costs a heck of a lot less.